Bhutan, a small kingdom in the Himalayas between India and China, has put “the Middle Path” at the centre of its development endeavours. This idea focuses on the putting environmental and cultural preservation at the core of its development. As a consequence, “Gross National Happiness” (GNH) replaces “Gross Domestic Product” (GDP) as the main indicator to track the country’s well being. 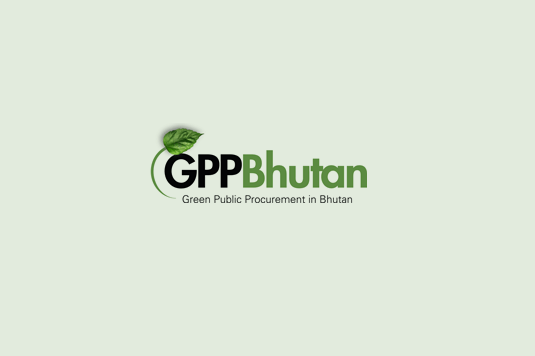 In line with these core Bhutanese development priorities, the CSCP and its project partners are introducing environmental and social criteria to the public procurement cycle in order to scale-up demand for more sustainable products across different sectors and to leverage green industrial development through public demand. Public authorities are major customers in countries worldwide and, in particular, in Bhutan where public procurement accounts for 60-70% of the government budget. Unlike the European Union wherewhere public procurement accounts for 17% of the GDP, it amounts to approximately 35% of the the Kingdom of Bhutan’s GDP in 2012/13. Areas of frequent spending include office and server ICT equipment, vehicles, office suppliers, fuel and electricity, public services as well as construction works. Public institutions have significant purchasing power to choose more sustainable goods and services and to contribute to sustainable consumption and production (SCP). GPP is an instrument to increase the demand for sustainable goods and services thereby facilitating sustainable production. Moreover, public demand for more environmentally friendly and socially advantageous goods and services is catalysing sustainable innovations in Bhutan. GPP looks to increase value for money across the asset life cycle rather than simply at the point of purchase. As the European Commission states: “it provides a process whereby public authorities seek to procure goods, services and works with a reduced environmental impact throughout their life cycle when compared to goods, services and works with the same primary function that would otherwise be procured.” To be a success, GPP needs clear and verifiable environmental criteria for products and services. The project leverages GPP in Bhutan as a powerful up-scaling tool to lower the direct negative impact of state-consumption on the environment. It incentivises sustainable production among suppliers in Bhutan —in particular SMEs,build demand-side (procurers) and supply-side (SMEs) capacity— encourages sustainable consumption of private households, and facilitates green economic transformation. The project is having a significant impact on greening Bhutan’s procurement policies, supporting more sustainable production of small and medium enterprises and increasing sustainable consumption in Bhutan. It is expected that GPP will increase FDI in Bhutan by 6-8% across the target sectors energy, roads, forestry, public services, and agriculture. With the help of this action, Bhutan is embarking on a long-term pathway to utilise GPP as a lever to ‘switch’ towards more SCP patterns. The project kick-off meeting took place in Thimphu, Bhutan, on 31st March 2014. The project will run for 3.5 years in total and is funded through the EU SWITCH-Asia Programme.